One of the best features of the stock flower is the many beautiful colors in which they come. A simple arrangement of pure stock flowers in a uniform color, such as this beautiful bouquet of 15 deep purple stems, offers a beautiful arrangement that looks like it was plucked fresh out of a farmer’s market. A bouquet such as this would be a fantastic gift for that special someone if chosen in their favorite color. If you are looking for a more cheerful look, a mix of several of the colors in which Stock flowers come is a great way to brighten someone’s day. As mentioned earlier, stock flowers come in a variety of different colors that, when mixed together, make for a dazzling bunch of full, lush flowers. 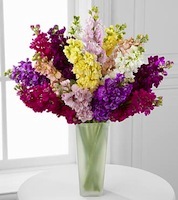 This stunning bouquet of 15 multi-colored stems features a full range of peach, purple, pink, white, red and yellow. Mixed color stock flower bouquets look like they are straight out of the garden and are a beautiful option if you are looking to send a unique bouquet that shies away from more traditional bouquets. While stock flowers look gorgeous when they are the main attraction of the bouquet, they are also a beautiful option for a mixed-flower bouquet. Because they are both tall, and boast bountiful blooms, they add an exciting depth to bouquets to bring attention to the flowers surrounding them. This eye-catching bouquet mixes lavender stock, lavender roses and pink stock to produce an arrangement that looks like it is straight out of an english garden. Next time you are looking for a unique and elegant bouquet of flowers, consider the stock flower, its fragrance and beauty will not disappoint!